Kammarton Bulgaria presents SHAKTI Pumps (I) Ltd.
SHAKTI Pumps (I) Ltd. is a world leader in the manufacture of submersible pumps and motors with superior quality and energy efficiency. Vertical multistage centrifugal pumps, domestic water pressure booster pumps, self priming pumps, end suction pumps and openwell pumps, etc. with long life and easy to maintain are part of the extensive products range. 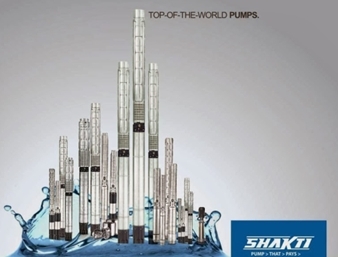 Shakti Pumps offers comprehensive and reliable pumping solutions with superior quality and energy efficiency. The pumps are largely used for applications like drinking water supply, agriculture, irrigation, industrial applications and processes, pressure boosting in high rise buildings and townships, rural/urban community water supply schemes, waste and sewage water treatments, firefi from ting and so on. The deploying of the latest technologies and the development of innovative products with new materials, applications and processes from R&D (Research and Development) department led to the certification from the independent UL, CE, ISO, BIS, ISI, and the Bureau of Energy Efficiency (BEE) has granted 5-star ratings to more than 260 of our pump models. Shakti pumps (I) Ltd. has a distribution network in over 100 countries across the world and Kammarton Bulgaria is the only authorized representative and service center for Bulgaria.